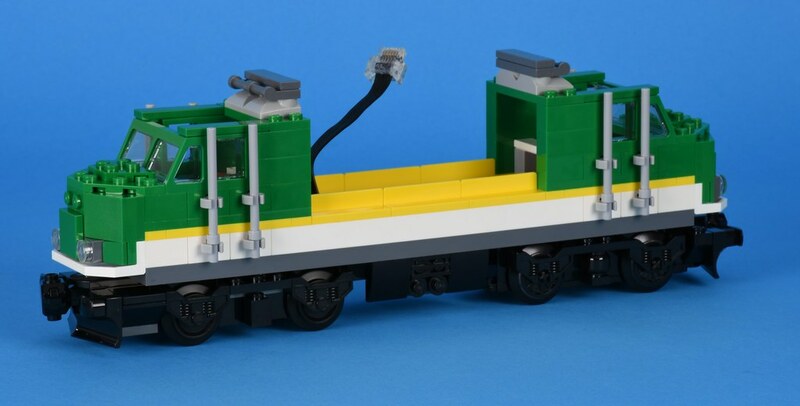 It has been three years since LEGO released a new Cargo Train. 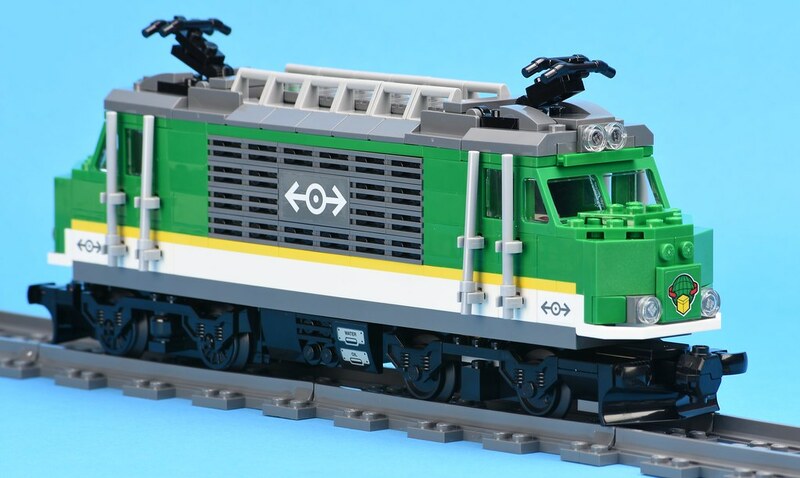 This year's set is special for two reasons: first LEGO has unveiled a new Powered UP, Bluetooth enabled, power functions system, and secondly, this year's 60198 Cargo Train has about 30% more parts than any comparable LEGO train set. 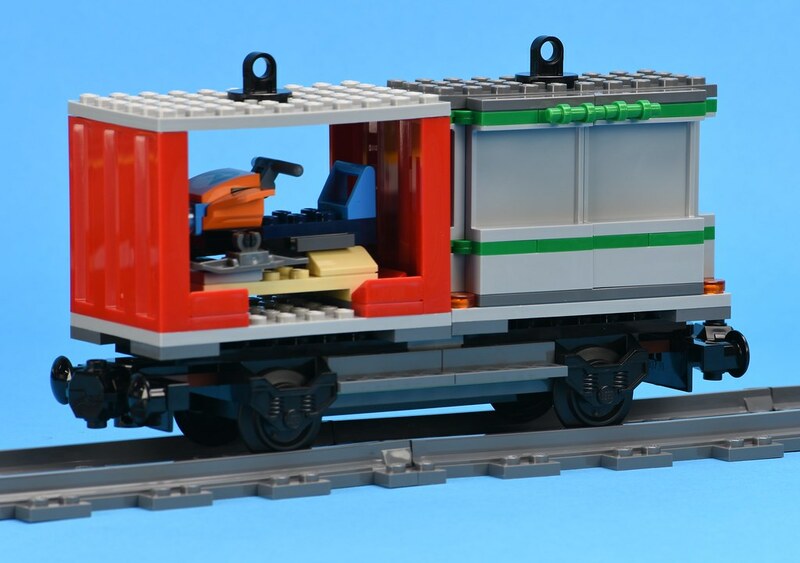 Read on as I describe this newest cargo train in the LEGO Train Network. The front of the box shows the cargo train stopped at a siding with the crane car unloading the two small shipping containers. A security guard is nonchalantly talking to the train driver while a villain is lurking behind the locomotive. There is a diagram of the recommended track layout and an image of the new Powered UP handset. Back of the box shows the train all connected together. It has several images showing some of the play features and some more information on the new Powered UP power functions system. 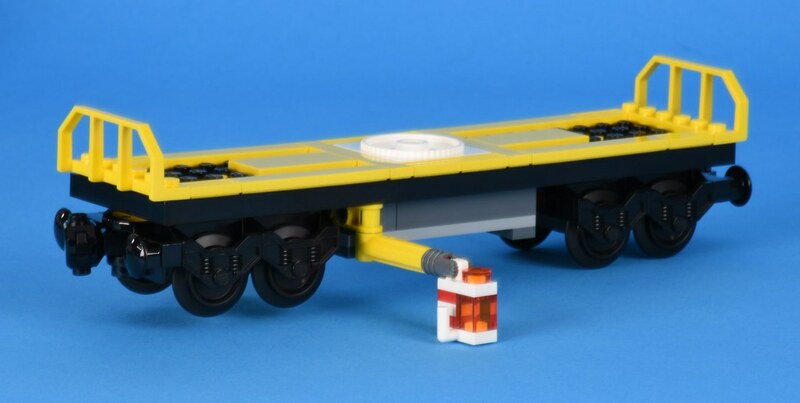 The side of the box shows that when the locomotive is connected to the rolling stock, the train measures 83cm (32.6 inches). The instructions are split into six booklets and come in a bag that also protects the sticker sheet. There is a reasonable number of stickers on one sheet. There are six minifigures in the set. The minifigure parts have been seen in several sets so there is nothing new about their attire. 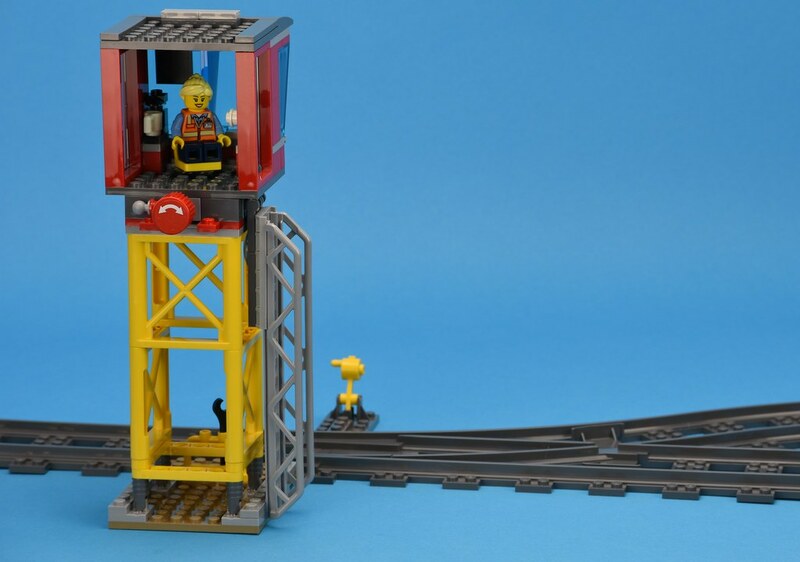 The train driver and crane operator are wearing the olive green LEGO Rail Train System overalls. They both wear a high-vis orange vest. The train driver is wearing a red baseball cap while the crane operator is wearing a hard hat that includes her hair. The forklift driver is wearing an orange and blue overalls. He has a grey-blue hoody underneath his work wear and a radio in his back pocket. He has grey protective gloves. The security guard is wearing a stab-proof vest over his white uniform. He has a radio in his back pocket and a cable up to a remote microphone. He wears a green baseball cap. The track controller wears a pale blue and orange overalls. She has an ID card clipped to her pocket and a pen on a lanyard around her neck. There is a villain in the set wearing a black leather jacket with lots of buckles. He holds a pair of binoculars to keep an eye on what is going on around him. The build is split into discrete building steps that links the booklets and numbered bags. I'll take you through each build component. 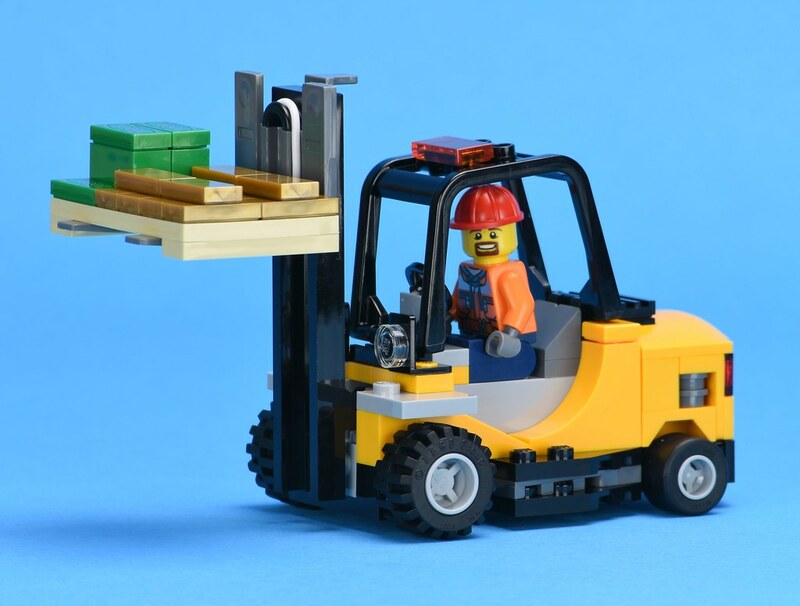 Book 1 with bag 1 builds the yellow forklift and a pallet of money and gold bullion. 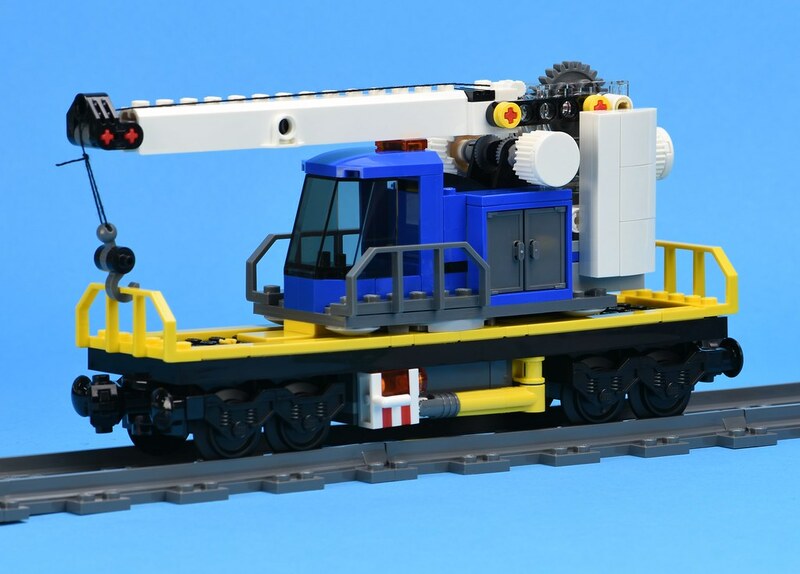 In my opinion, this forklift is significantly better than the red forklift found in 60052 Cargo Train as it is brick-built and does not rely on big moulded parts. However, I do believe that the forklift should have had a couple of control levers. The pallet contains a cargo that includes bundles of money with twelve gold bars. 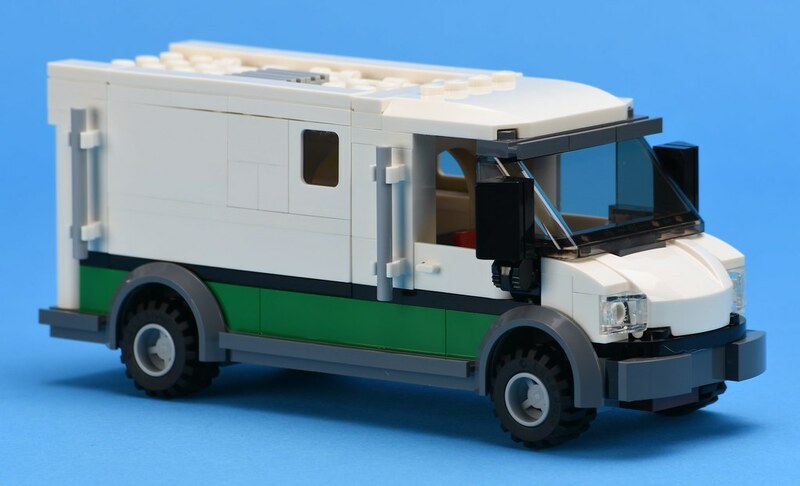 Bags 2 and 3 build the security van. 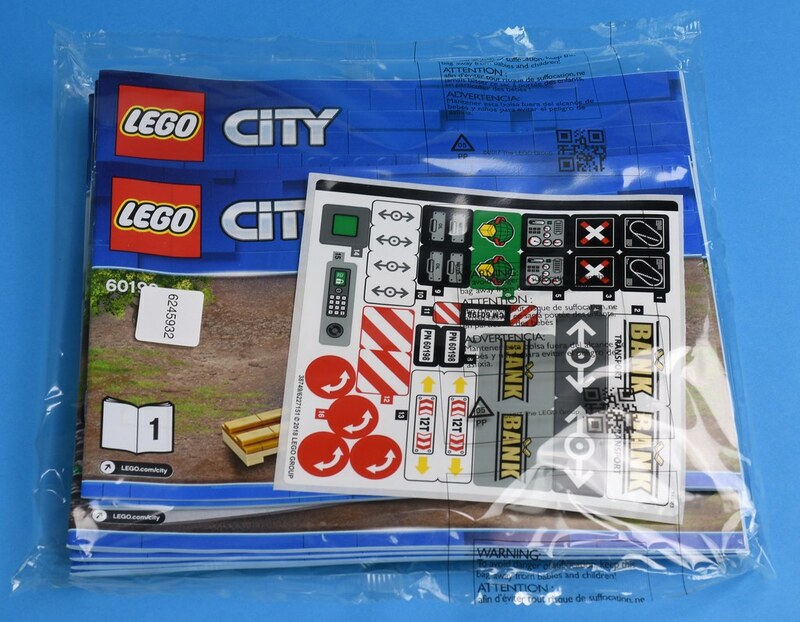 The chassis is made from the parts in bag 2. The van is completed with the parts in bag 4. This is what the van looks like without stickers. Images with stickers applied can be found at the end of this review. The van has an interesting way of loading the cargo: the whole side of the van hinges open. Also, there is an opening between the driver's cab and the security area. 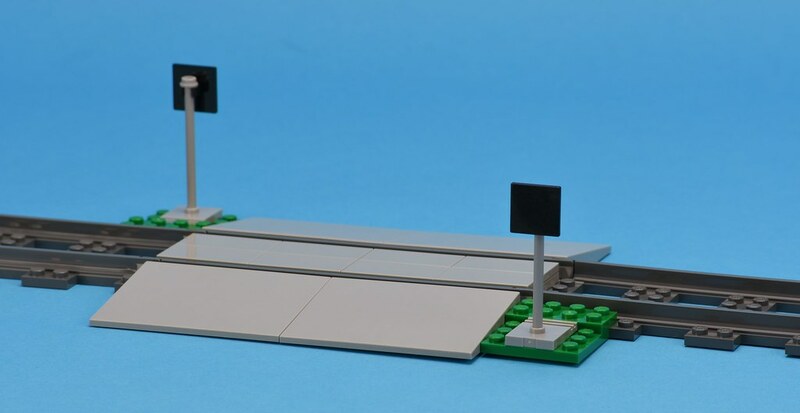 The set includes a basic level crossing. The buffer stop (sometimes called a stopblock) is provided for the dead-end-siding. The remainder of the book 3 and the parts in bag 5 start assembling the locomotive body. The locomotive is double ended so most steps sees equivalent building steps taking place at both ends. Book 4 along with bags 6 and 7 completes the locomotive. 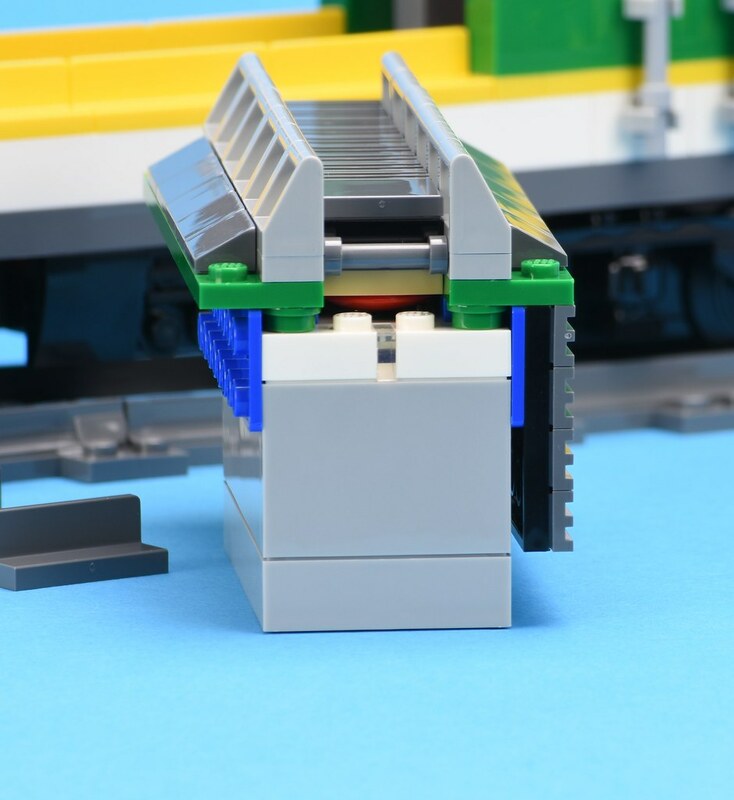 An interesting change due to the new design of the battery box is that the battery box forms an integral part of the locomotive body. This is because the power cable plugs into the end of the battery box rather than on the top (as seen in the former Power Functions battery box). It is very easy to remove the battery box section by removing the four dark-stone-grey 1x3 walls. The rolling stock is assembled using Book 5. Bag 8 makes the log flat-wagon and bags 9 and 10 make the crane car or breakdown crane. Three brick-built logs fit tightly between the stanchions. A freighthopping minifigure is hiding between the logs. The minifigure has a pair of binoculars. The crane chassis is made from parts in bag 9. The flat-car is supported by two outriggers that also includes two orange warning lights. The crane is complete using parts from bag 10. The outriggers have been retracted into the chassis. The crane boom telescopically extends. Book 6 builds the container flat-car and the signal tower. Bag 11 makes the flat car and two small shipping containers. There is one red open-sided container and a transportable vault. There is a snowmobile on a pallet in the red shipping container. Bag 12 makes the signal tower. The signal tower has a coffee machine for the signal operator. The signal can be changed by rotating the lever. 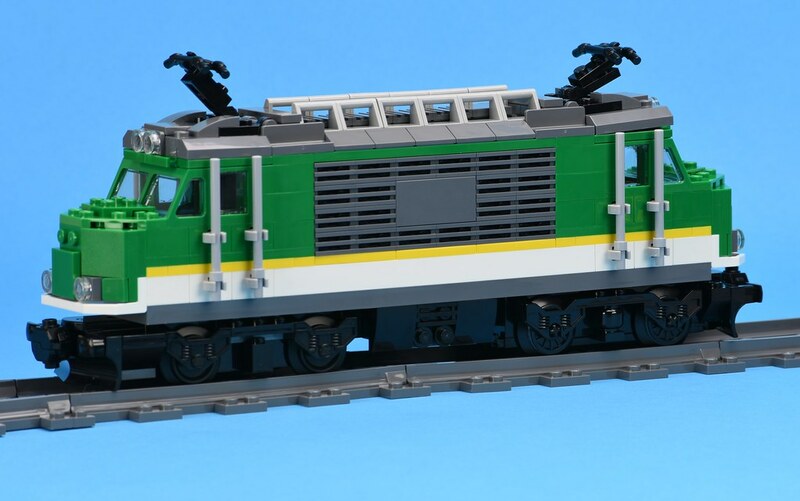 The finished electric locomotive is the best part of this set. There are many designs of similar locomotives in the real world. This is the first LEGO locomotive to also include the green freight logo. This image has only been seen on trucks and forklifts in earlier City Train sets. The crane car has a safe working load of 12 tonnes. You can see some engine gauges when the grey doors are opened. The crane boom rests on the orange warning light above the operator's cab. 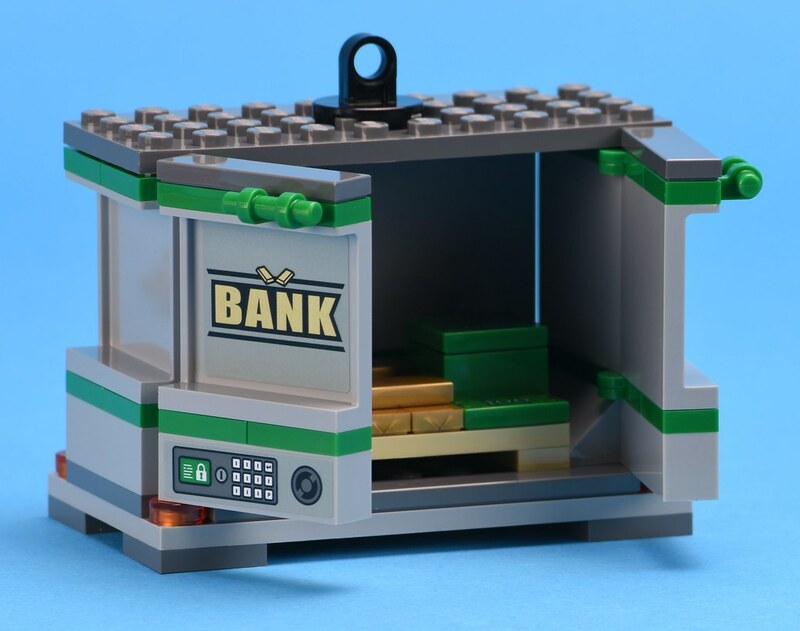 There is a transportable vault. It has a keypad and safe tumbler on the security doors. The snowmobile has the logo from the Arctic theme of sets. The new power functions, Powered UP, consists of three units: the handset, the battery box and the train motor. At the moment, there is not any Powered UP parts for sale at Shop.LEGO.com. There are two immediate changes that are apparent with this new system: the battery box cable points have been moved to the ends, and there is no need for an IR Receiver. The handset pairs with the battery box via a Bluetooth connection: Simultaneously holding down the green buttons on the handset and the battery box for more than two seconds will automatically cause a paired connection. The train motor also has a shorter cable than the former train motors. There is less spare cable twisted inside the train. I think that LEGO should supply a small Phillips screw driver for opening the battery box. The screw head is recessed further than previous battery boxes and the screw driver needs to be very slim. I deliberately tested the Powered UP functions as I wanted to test the batteries endurance. After over two hours, the train was still running at a reasonable speed. The train motor runs faster than this train could cope with. The handset has ten incremental speed settings and anything over setting five caused the train to derail off the curved tracks. I will re-run this test for my review of 60197 Passenger Train when the dining room table is not needing to be cleared for the evening. I will also install a former Power Functions train motor and IR Receiver to compare performance. Here is a video by from Sariel's LEGO Workshop that takes an in-depth test and comparison of LEGO Powered UP vs LEGO Power Functions. I have two views on this set: one as an adult who looks critically at the train set while I can also see it as a child's toy. I like the green locomotive. It is a refreshing design and adds a new look to the modern City train network. 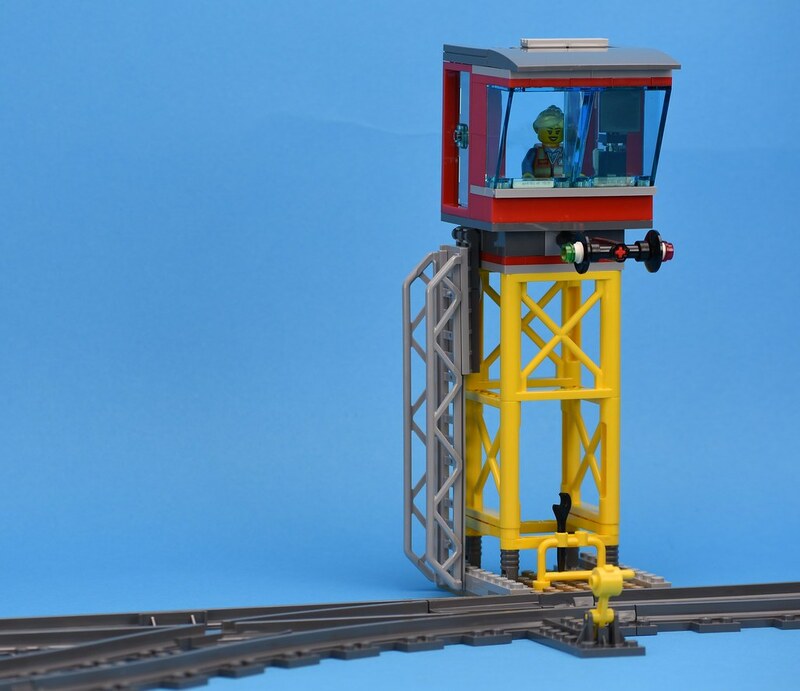 It is also good to see a signal tower and a siding buffer stop included in the set. There are some features of this set that I didn't like. I thought that the rolling stock and vehicles were somewhat of a let-down. 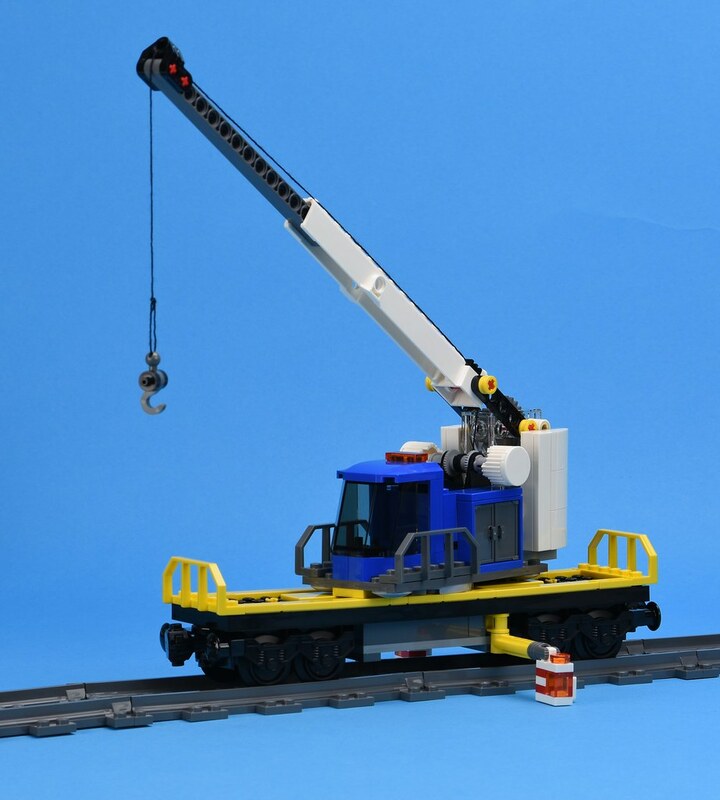 It seems unrealistic to use a crane car to load and discharge cargo from flatcars and wagons. The crane car would be better served as a recovery crane following a train derailment. It would need to have a safe working load at least ten times the current rating of 12 tonnes. 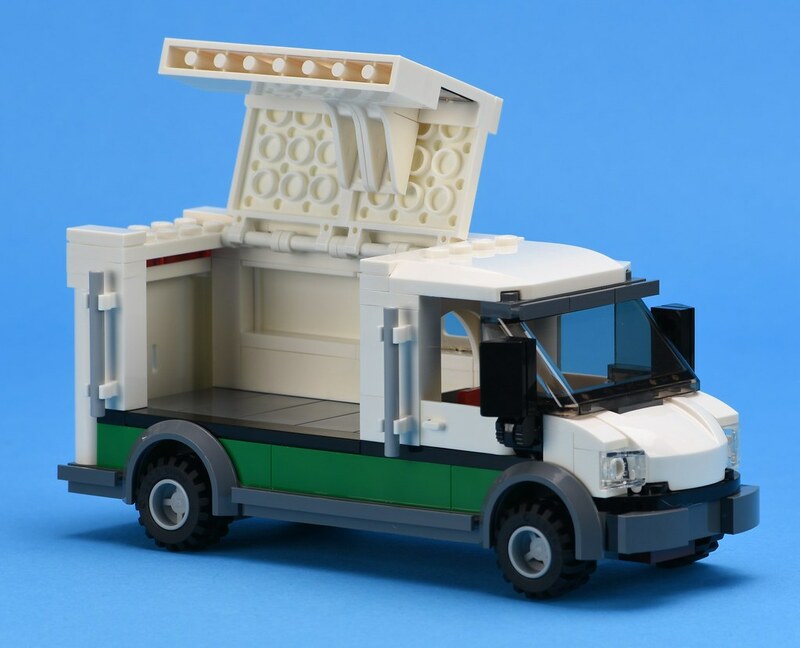 The security van seems to be very unsecure with a large side-opening door and that the cab allows access to the secure freight compartment. The forklift should have had some control levers. 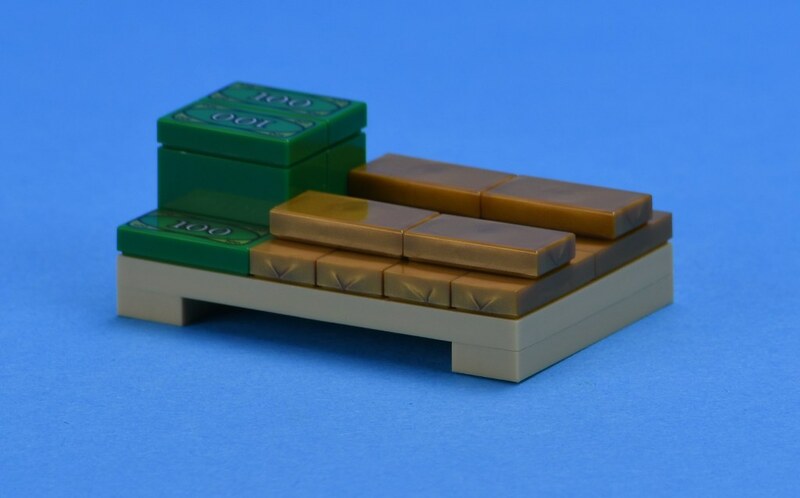 On the flip side, I believe this set has plenty of play potential for younger LEGO fans. There is a villain who is attracted to the bullion that is being carried in the portable vault. This vault could also be lifted off the flat car by a helicopter. 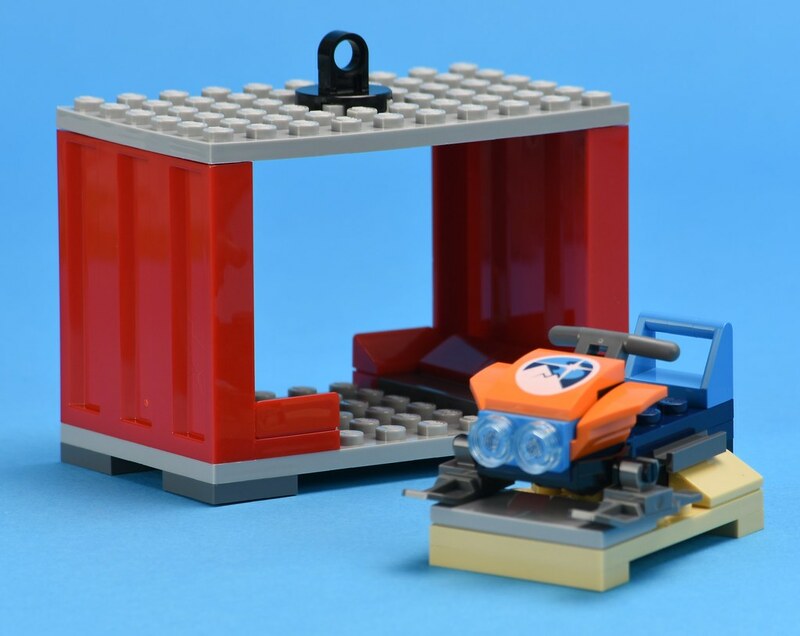 The other freight container has a snowmobile that could be used for a quick getaway. 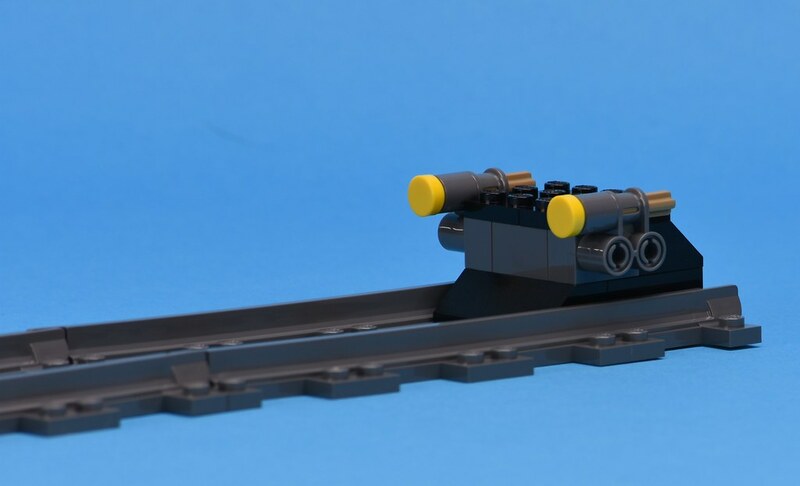 This set has the largest amount of train track of any LEGO train set so it is a self-contained set or would add significantly to your existing LEGO trains. I agree that there's a lot to like about the set. I love that they have a train robbery element to tie the set into the greater City theme, and the little orange snowmobile is a lovely reference to the current Arctic theme. I adore the control tower, and although it's very simple, I really love the log car. But I'm with you on the crane carriage being, well, odd. And the container crate carriage doesn't look much better. I'm also just not keen on the engine. I thought 60052 was gorgeous in comparison, but the green engine here just doesn't do anything for me. I look forward to the Passenger Train review, to me, the passenger train is much stronger of the line than the freight engine. I like that they are being more generous with track. 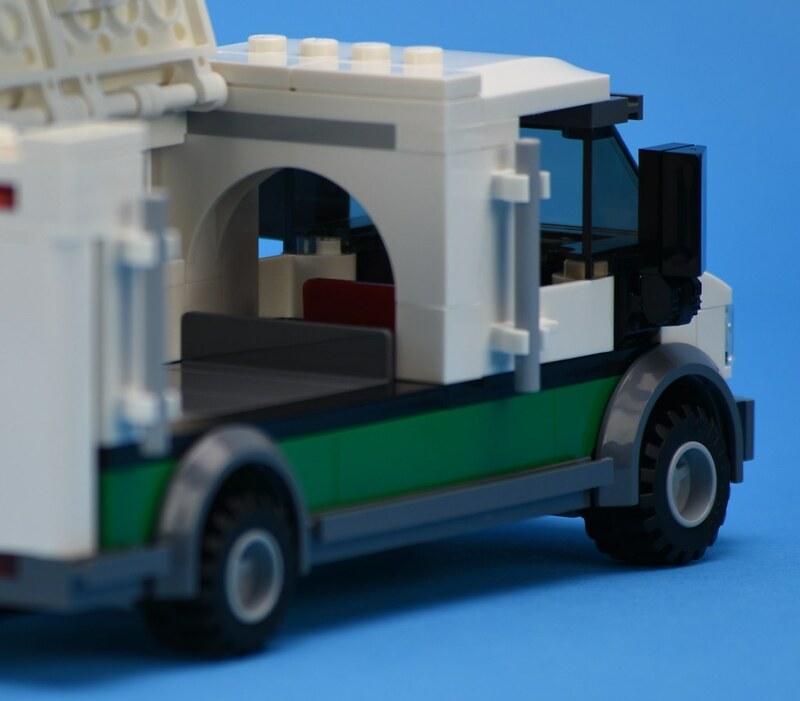 I wish they would put less bricks into the fluff like the bank van and put them into the train cars instead though. I'm astounded that the whole "battle in a box" mantra has seeped into train sets as well. Great review. Love the forklift, buffer, and tower. I know that individual trains don't sell, but I do wish we would get another nice locomotive by itself one day. @FlagsNZ Thank you for your thorough review! I totally agree with the double AFOL/kid perspective: we adults would definitely want more "mature" playability out of this (and generally every) new set, but since TLG's aim is to entertain kids, this set will most probably be successful in developing creative playing. And - yay! - lots of straight tracks, at last! Not a Lego Train person but did pick up 60051/52 cheap (40% off) as well as the holiday train. It's nice that they've decreased to size and number of components to get the trains running. My only complaint would be we only get one switch track. Love the tie in to City and Arctic. It's weird that trains derail so easily why the need for high speeds then? I think the 60052 set was better (I just got that for my son's birthday and built it a few weeks ago with him, and its a fantastic set). 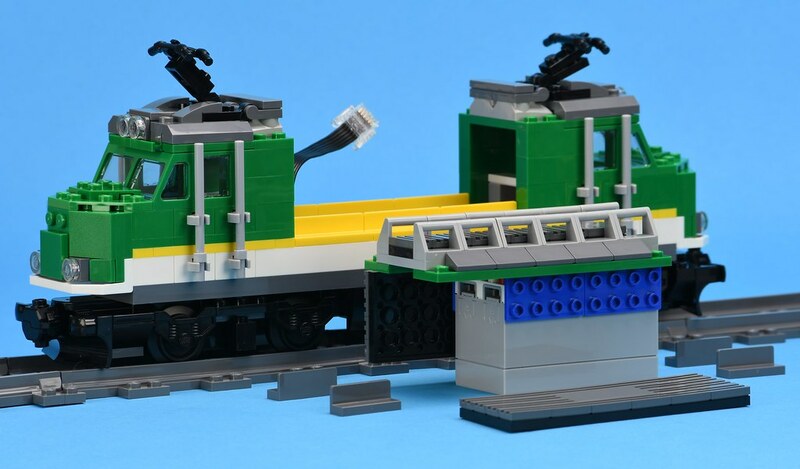 I particularly prefer the sets with trains with actual door pieces on them as opposed to brick built doors - it pays respect the 12v days and gives it that classic feel. Seems a curious decision to include the money/villian aspect. I would have preferred all train stuff for this set. I'm sure children could add villians if they wanted to. Looking at the box art, I think I would be disappointed as a child. Admittedly, only one turnout is shown, but the art strongly suggests another just out of view on the left. The motor looks as if it could be used for the tender of the latest Hogwarts Express, so that's welcome. 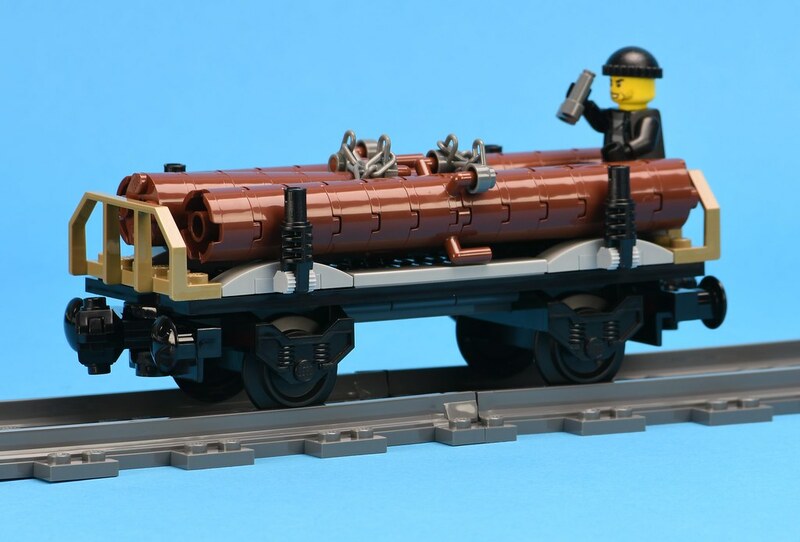 I love the comical element with the thieve hiding in the logs, I bought the last cargo train set and the other train I am getting is the Imperial Cargo Train and that is it. These things are expensive. 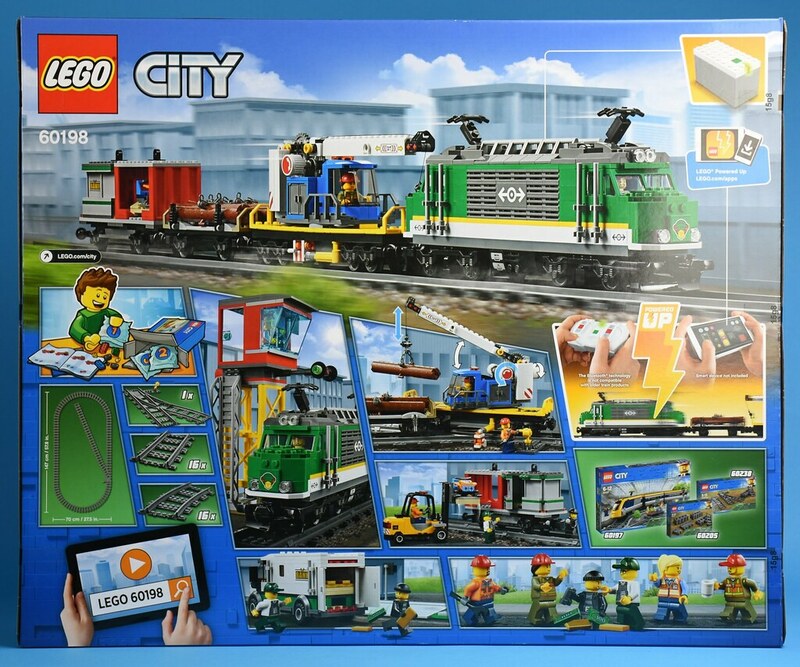 Not really into cargo trains but got this for AU$190 (AU$110 off RRP) so cant complain. Will compliment the blue one I have. 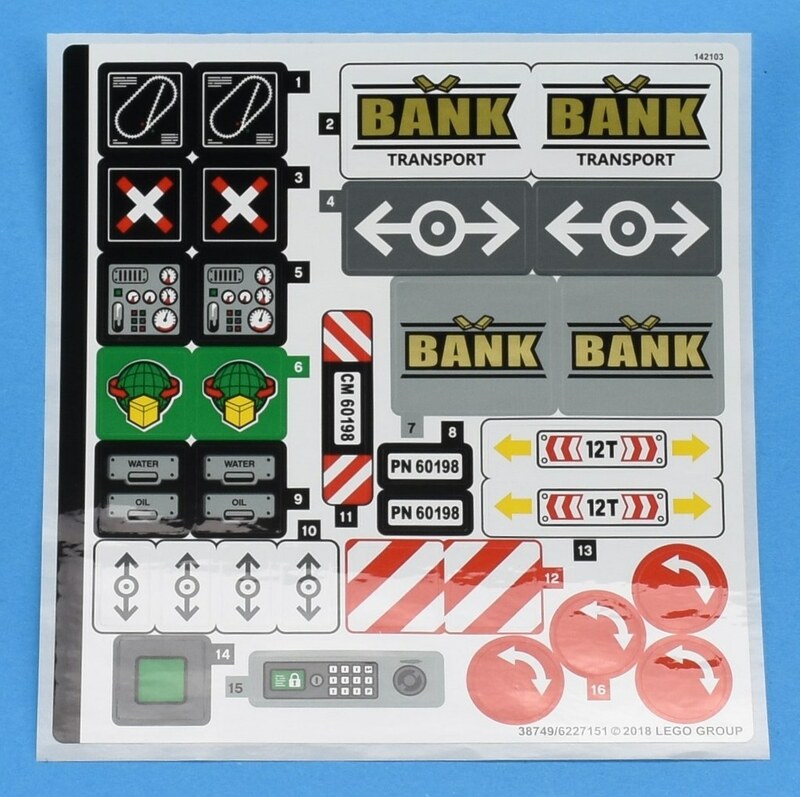 If we are going to add a criminal to a Train set, why not have a City Train subtheme? Have a small train the robbers are trying to steal. Have a train station that gets robbed. Heck have a train prison. 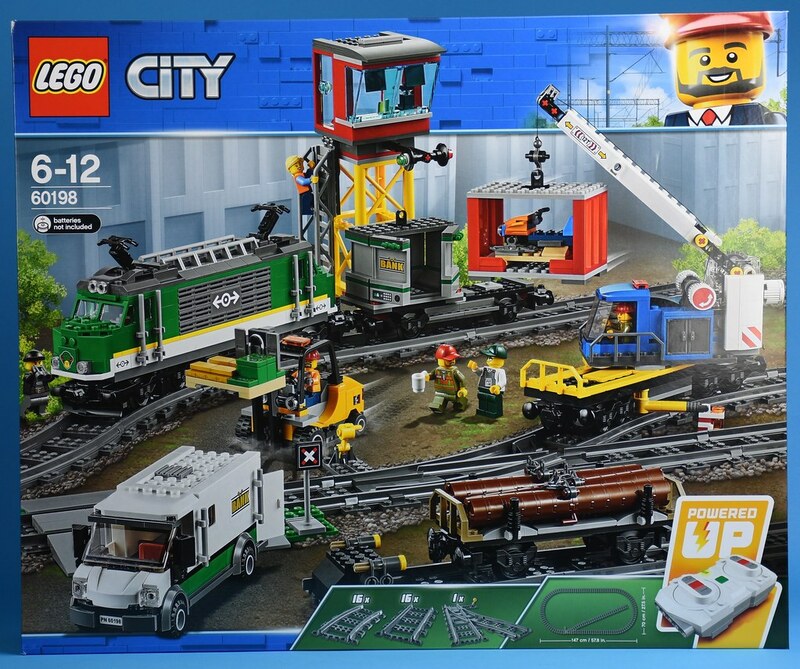 Maybe if LEGO expanded more trains into the City line the trains would sell better and we could et smaller sets. I'd say get a train aaybes. The new system takes up a lot less space n the train than the old one and isn't too much more. Slight but important copy-edit, you've used 'parsed' talking about bluetooth connections, the term you were looking for is 'paired'. And 'parses' should be 'pairs'. @David1985 Calling it now: Next year's Police subtheme will be "Train Police". I am afraid that it is not possible to connect more than one train to the app. I have 4 train today i can control with one controller. (the old system supported 8 trains on one controller) . @ HugeYellowBrick: I was going to comment on the strange track layout on the front of the box but decided to leave it out. It's the only way that a crane car could effectively load and discharge cargo from more wagons and flat cars. 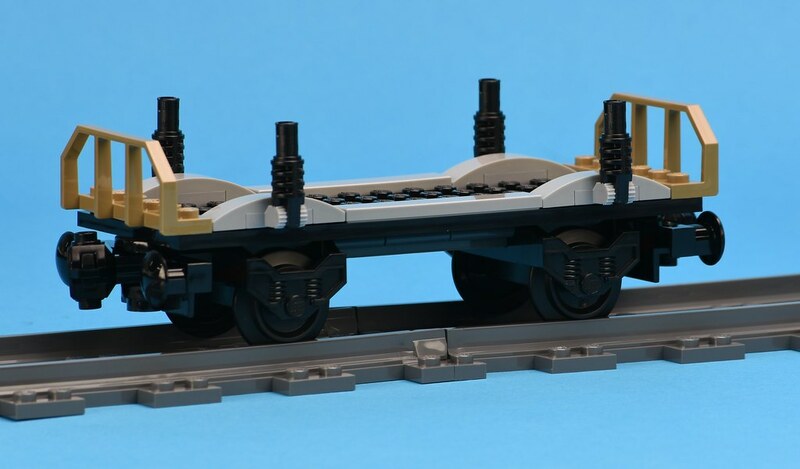 In the real world, this would probably stress the sleepers, damaging the track and ballast. @ curious: You are right and I have changed the article accordingly. Thanks. Not complaining but its great both this set and the new passenger train set, despite being bigger than past sets are cheaper then last time. Makes a nice change! @Shaase You will need the extra power for longer and/or heavier trains. Thanks for the review, I like this set more than I originally thought based on your description, and will probably add it to the wish list. The green color and styling on the engine does look great, and I am loving that signal tower. In general lots of nice details here. I could have done without the silly villain stuff, but whatever. So... Did you like it or not? You never actually said if you'd recommend it. You just highlight the stuff you didn't like. I'm personally planning to pick this up for my city. Not thrilled about the new Powered UP system. It looks like I won't be able to add headlights to the locomotive, like I did it with 7939, 60051, 60098, TGV Horizon and all of my MOC locomotives. Also, curious if the new remote supports multi-train controlling. Please do some comparison of the PF yourself. The Sariel video is useless in embedded format. The guy still refuses to talk, and miniscule text under the progress bar delivers no information.